Achieve the look of luxury without spending top dollar by bringing this rectangular, marble top dining table home to your dining room today. 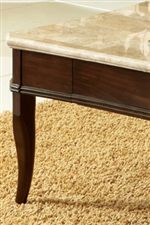 In addition to the beautiful table top, this piece features beveled, tapered wood legs and a double reeded table edge. To complete the look, order the collection's dining side chairs upholstered in ivory colored fabric (MS800S). The Marseille Transitional Rectangular Marble Top Dining Table by Steve Silver at Walker's Furniture in the Spokane, Kennewick, Tri-Cities, Wenatchee, Coeur D’Alene, Yakima, Walla Walla, Umatilla, Moses Lake area. Product availability may vary. Contact us for the most current availability on this product. The Marseille collection is a great option if you are looking for Transitional furniture in the Spokane, Kennewick, Tri-Cities, Wenatchee, Coeur D’Alene, Yakima, Walla Walla, Umatilla, Moses Lake area. Browse other items in the Marseille collection from Walker's Furniture in the Spokane, Kennewick, Tri-Cities, Wenatchee, Coeur D’Alene, Yakima, Walla Walla, Umatilla, Moses Lake area.